Raise or lower the deck with ease. The Raptor® Flip-Up has the best warranty in its class in the industry. Extend your productivity into the late hours with our optional light kit. Kit contains two high-quality 12-volt lights. Raptor Flip-Up is rated 3.9 out of 5 by 45. Rated 5 out of 5 by Disableddude from I enjoy mowing! Bought the flip up this spring and it did a beautiful all summer. I am disabled so I have to be placed in the seat but then it is a joy to mow. The flip up deck makes it easier for my wife and kids to help with the maintenance. Rated 1 out of 5 by jerry69 from LEMON In less than a year it has been in the shop 6 times. 3 gas tanks and the gauge still does not work, 2 PTO switches, and now the belt came off and snapped. When I contacted the manufacture they told me this is not meant to cut 2 acres and that I would need to work with the dealer for service.So this mower is not meant to be used that much. Why do you have it listed for 3 acres per hour? Rated 4 out of 5 by bslow47 from Almost perfect. The flip up is a thing of beauty if you don't like getting on the ground to change blades. It is a compact comfortable machine. Had some deck level issues and believe my dealer figured it out. On the 48" there is only two scalp wheels on the front of the deck. can be a problem on the discharge side. I am fabricating a bracket to hold the third scalp wheel like it should have had. I can see why they did not put it on because space is limited on the 48" for one. I put a mulch kit on and it does a great job mulching but does increase the noise factor quite a bit. had problem with the lever safety switches that would come out of adjustment. The bolts that you loosen to adjust are hard to get at because they are on the bottom side of the switch. I turned them around and it is a lot easier now. Rated 1 out of 5 by P Santos from Nothing but problems I bought this model for the flip up design. Been back 3 times for the gas gage, had to replace the lift piston. And now it keeps through in belts. This is my 2nd review because they wouldn't post my first one. I've been getting the run around by the dealer and he's pointing fingers at his salesman. Terrible customer service on both parts. I was told I was getting a new machine last year and it's know May and still nothing. Rated 5 out of 5 by kdxyardsale from Workhorse, well built, dependable, love it! I bought the first Raptor Flip Up in my area 18 months ago. I have never had a new mower. Paid my house off and treated myself, I mow 2 acres, some is very landscaped, some wide open. My neighbors are all jealous and so is my dad (old farmer). It cuts well at a high pace. I added the flex front as I flood irrigate and have some dips, huge difference. My mowing time has been cut in half or less over a traditional riding mower with a steering wheel and shifter. Since the model was a new design when I bought it, there was a fuel gauge issue, and a belt throwing issue. My dealer took care of both of these issues pronto for free, he even got me to the front of the line in his shop. I bought the flip up because I am OCD about my equipment and I clean the underside of the deck everytime, every mower deck should be like this, I love it. The only suggestion I have for the manufacturer is to make the hour meter only count when the mower is running, not just with the key on. I am planning on adding a relay to solve that issue myself, my old brain forgets to turn the ignition off after lifting the deck so I have a couple of false hours on the meter. Maintenance is easy and all of the parts normally serviced have a part number on them so it is easy to order replacements. I do not believe I will even shop around next time, I am a Hustler fan! You can save a dollar or two elsewhere but my Raptor FlipUp was worth every penny. Rated 1 out of 5 by brokerancher from Worst purchase ever Don't buy a raptor unless you like to spend an hour putting the deck belt back on. The replacement belt cost is very expensive,so you might want to ask a dealer the price before you purchase. Rated 2 out of 5 by bugman from Poor Quality I bought this in July and it's been nothing but problems since day one. First day the fuses burned out. The gas gauge quit working so the dealer sent me a new one, that I installed, still didn't work so he came and got the mower and put a new tank In and it still doesn't work. The deck belt was coming off so the dealer sent me a new one and it was coming off also. Rated 5 out of 5 by Johnhunter247 from No regrets! Awesome! This is my second hustler mower. My first still running like a champ! It’s the x one. I seen this flip up deck and I couldn’t resist. It is more than I thought it would be. The poor x one is being neglected now. The flip up deck for cleaning and sharpening blades can’t be beat. Awesome! Awesome! Awesome! As stated in a previous review I will not shop around. If ever I am in the market for another mower I am in the hustler family for life! 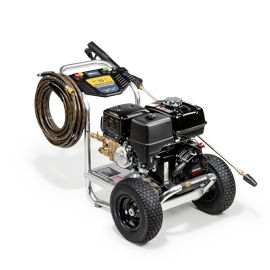 I wish hustler would come out with blowers, weed wackers, chain saws, edgers and any other lawn equipment built from the same quality. I would be first in line! Rated 1 out of 5 by John88 from Broke after 1.7 hrs I bought a new Flip Up. After the first use of it at 1.7 hrs the blade spindle pulley came off and damaged the belt, pulley and spindle due to either a loose bolt and / or missing washer under the head of the bolt that hold the pulley down. I think they have great potential and is a good machine, but not looking to good for their QC department! Rated 5 out of 5 by Jerry from Best Ever!!! I bought the Raptor flip at the beginning of the 2017 cutting season. It has cut my mowing time in half. It starts right up and with the mulching kit I never have to rake. Great mower!!! I think there should be an instruction class when first purchased. Rated 4 out of 5 by Thomas68 from Mows great I have no problem with how the Raptor Flip-Up mows, it does a great job. The problem is the fuel gauge. It has been replaced 3 times and still does not work. Very frustrating!! Now they have made it worse by replacing the fuel tank which is not transparent, so now I really don't know how much fuel I have in the tank. It's under warranty, I hope they get to the bottom of this and fix it. Rated 5 out of 5 by Hoser20 from handles great! I bought this model for the flip up deck. It lets me clean the deck and sharpen the blades more often. That's huge! The no choke feature is great. It's just an all around great mower. Rated 1 out of 5 by hewent2paris from THREE BREAKDOWNS UNDER 30 HOURS The title says it all. Mower had interlock contact issues that I had to fix within the first week. Then the sending unit went out within first month. Now with less than 30 hours the safety interlock on the flip up was apparently was too close to the idler and my mower would'nt start again. I bought this mower for ease of cleaning. There has been little to like since day one. On a side note I've never had a mower throw so much dirt and grass around my legs. Must be the location of the deck. DO NOT BUY THIS MOWER! Rated 5 out of 5 by Mike M. from Best mower I have ever used! I’ve used my Raptor with the tilt deck feature for two seasons now and it’s the most convenient feature ever designed. It makes cleaning the deck so easy and convenient and will extend the life of the deck for a long service life. The mulching feature is another big plus. Rated 5 out of 5 by Sharon from Nice mower, mows & mulches beautifully and fast I purchased the flex forks for a better ride and even mowing. It has a nice ride and mows fine. I also purchased the mulching kit, and I'm very pleased with that. Our lawn isn't left with huge rows and clumps of dead grass after mowing now. Great machine! Rated 5 out of 5 by Lbond from Love the flip up deck Bought hustler flip up couple months and couldn't be happier with ease and speed of mowing. Tractor style use for 3yr and took about 1hr 45min to cut around all obstacles in yard almost an acre and now it takes about 1 he and looks so much better. Rated 5 out of 5 by Pappy from Outstanding mower I've had the Hustler 48" Raptor Flip Up for 2 years and have found it to provide excellent mowing with either the high or, low lift blades. 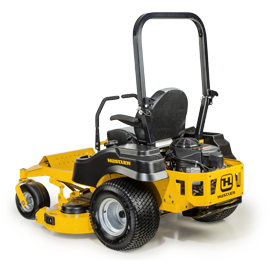 The 25HP engine provides plenty of power and the welded deck is strong and sturdy. The "flip up" deck feature is a fantastic alternative to a regular deck when changing blades and cleaning. 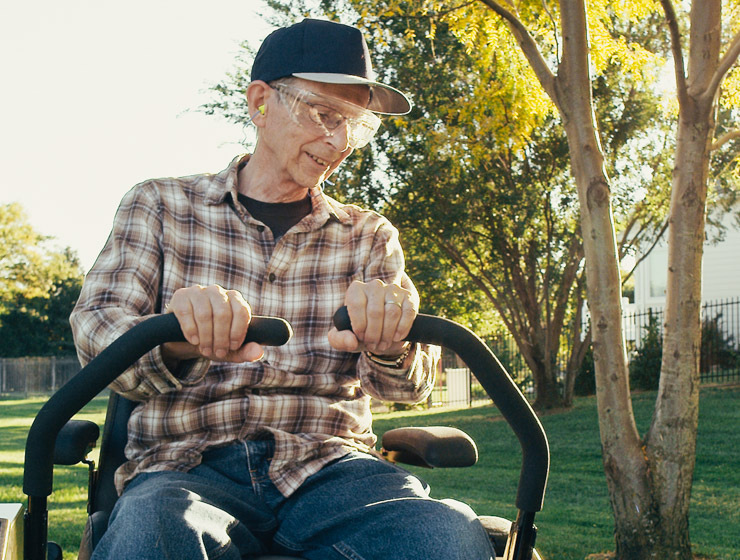 Mower operates smoothly, great steering, and with the added Flex Forks in the front the ride is very comfortable. Overall, an outstanding mower and is highly recommended. Rated 5 out of 5 by bill54 from Fantastic Lawn I bought the Raptor in early April. May is the toughest mowing as everything is growing so fast. My lawn has never looked better even with all the dandelions this time of year, I usually have to mow twice to get it all. Haven't had to yet, love it! I have cut my mow time by 1/3 so far, also had the mulch kit & flex forks installed, both work very well. The flip up deck can't be beat for cleaning & blade service. Rated 5 out of 5 by tbarr from An easier way to mow The flip up is great. I am so glad that we researched lawn mowers and came across this one. As we are getting a older, we needed something that we did not have to crawl under to clear or replace blades. We live in a very sandy area, so we go thru blades quite often. Cleaning after each mow is a snap, Just FLIP and wash. Couldn't be more happier with a mower. Rated 2 out of 5 by jrod6931 from Gas sending unit ,float or meter not working Bought this raptor flip up 1 year ago and has been to dealer shop 3 time for same problem gas meter stay's on E or shows half and stays there even when you fill up. This will be my 4 th time I will have to call dealer which take anywhere from 1-4 weeks to pick up mower. They don't know why this is happening and can not believe it but it is. Rated 5 out of 5 by ODH250 from LOVE IT!! LOVE IT!!! LOVE IT!!!!!!!!!!!!!!!!!!!! My husband purchased a, Hustler 54" Zero turn mower, in April 2017. He has fallen in love, with it!!! We are older people, and the tilt up deck, was exactly, what he needed. Sometimes he mows the grass, just to be mowing. ( The grass does not need to be mowed) I am thankful he bought it. It's his joy to mow now!!! Rated 3 out of 5 by Btal from Tough first year The first ten times I tried to use this mower it failed eight times. The next spring I went to cut grass and the belt came off. The dealer told me there were a bunch of recalls and he preformed these and I haven’t had another problem. Rated 4 out of 5 by SAM 1 from great mower Have had this mower for appox. 2 yrs. & everything is great except paint job. Dealer has replaced deck less than a year old and the new deck has already started to chip, so guess I just have to live with it & wait for it to rust out. Rated 1 out of 5 by Gaya from Terrible This is the worst lawn mower I’ve ever had. Brand new, the blades didn’t cut the grass. Sharpened, the blades still don’t cut the grass. Parts are falling off. It doesn’t work. Rated 5 out of 5 by bogie7 from Great features..., Purchased In March 2016.., very happy with the lift deck feature - makes it so much easier to clean.., sharpen the blades - flip deck is such a great feature!! Rated 5 out of 5 by Ollie70 from Love this mower! Bought this mower a few months ago. I got it for the flip-up deck, to make it easier to remove the blades for sharpening. Love the power that this mower has. Rated 5 out of 5 by petpev728 from Lift deck My first Hustler we bought in 2002, great machine. Traded it in on the Flip-Up last year and we love it. Easy to change blades and clean deck. Love it.